Jim Lehrer, who has reported the news of the day for more than 50 years, became part of it May 12 when he announced that he will step away from the weeknight anchor desk at PBS NewsHour in June. This week (May 19) Lehrer turns 77. “I feel good about this,” Lehrer told Current May 13. “I thought I might have second thoughts, but no. This was my idea, I planned it, I worked out a way to do it.” That planning began about three years ago, Lehrer says. A confidante during that process was Robert MacNeil, Lehrer’s longtime friend and former coanchor who retired 14 years ago when the show was called the MacNeil/Lehrer NewsHour. Pubcasters got a hint of Lehrer’s plans at the May 2009 PBS Showcase in Baltimore. He said his name would drop from the show’s title and a team would share anchor duties. When a news show features in-depth interviews recorded in the studio, the ability to shift among a number of people creates a necessary “illusion of movement,” Lehrer says, which helps maintain audience interest. The senior correspondent anchors — Judy Woodruff, Margaret Warner, Ray Suarez, Gwen Ifill, Jeffrey Brown and Hari Sreenivasan — also report stories. Their diverse talents, voices and faces further engage the audience, Lehrer says. The transition may have helped build audience: Viewer numbers are up 16 percent from March 2010 to March 2011. The 2009 revamp also called for completely merging on-air and online newsrooms (Current, Jan. 19, 2010) and hiring Sreenivasan to report on the Web and on the broadcast; that has tripled NewsHour’s online traffic. 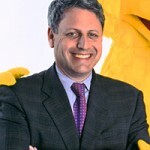 Gary E. Knell, president and c.e.o. of Sesame Workshop for a decade, will start work Dec. 1 with the same titles at NPR, the network announced today.